The mean age was 59 years (range 42-82), and 65% were males. HER-2 receptor expression was seen in two patients, one patient with Grade 2 squamous cell carcinoma (SCC) of larynx and the other with Recurrent Retro Molar Trigone SCC. Both of them tested 2+ on immunohistochemistry which was confirmed with FISH. There were no patients with ER positivity and one patient with Retro Molar Trigone SCC demonstrated PR positivity [Figure 1]. This study revealed a lack of significant ER and PR receptor expression that is contradictory to other studies. A study by Goulioumis et al. in 2009 on ER-β expression in eighty cases of human laryngeal carcinoma showed ER-β positivity in 83.8% of tumor cells while normal cells stained negative. Another study by Barrera et al. on ER expression in adenoid cystic carcinoma revealed that 8 out of 47 tumors expressed ER. The lack of ER and PR expression in our studies is difficult to explain, but may be due to epidemiological variations in the etiology of these tumors and further studies in a larger cohort are required to validate this in the Indian setting. HER-2 expression was seen in 10% of our patients and could prove a potential target for therapy with monoclonal antibodies or tyrosine kinase inhibitors against HER-2. Various reports of HER-2 expression in HNSCC exist in literature, but with conflicting data. Some studies report HER-2 expression as high as 39-76%, , whereas other studies have demonstrated a lack of significant HER-2 expression. , In the clinical setting, HER-2 tyrosine kinase inhibitor, Lapatinib (Tykerb/Tyverb ® , GlaxoSmithKline), has demonstrated some activity in locally advanced, unresected stage III/IVA/IVB HNSCC,  but not in high-risk surgically treated II to IVA HNSCC. To our knowledge, this is the first reported data on HER-2 expression in Indian patients, and further studies are ongoing in our setting to evaluate the role of HER-2 expression, its prognostic relevance and the antineoplastic activity of HER-2 inhibitors in clinical practice. Rubin Grandis J, Melhem MF, Gooding WE, Day R, Holst VA, Wagener MM, et al. Levels of TGF-alpha and EGFR protein in head and neck squamous cell carcinoma and patient survival. J Natl Cancer Inst 1998;90:824-32. Bonner JA, Harari PM, Giralt J, Azarnia N, Shin DM, Cohen RB, et al. Radiotherapy plus cetuximab for squamous-cell carcinoma of the head and neck. N Engl J Med 2006;354:567-78. Vermorken JB, Mesia R, Rivera F, Remenar E, Kawecki A, Rottey S, et al. Platinum-based chemotherapy plus cetuximab in head and neck cancer. N Engl J Med 2008;359:1116-27. Wolff AC, Hammond ME, Schwartz JN, Hagerty KL, Allred DC, Cote RJ, et al. American Society of Clinical Oncology/College of American Pathologists guideline recommendations for human epidermal growth factor receptor 2 testing in breast cancer. Arch Pathol Lab Med 2007;131:18-43. 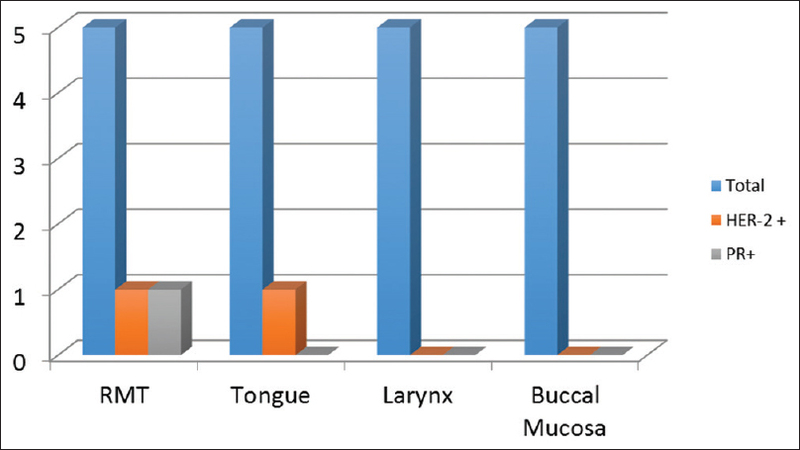 Goulioumis AK, Fuxe J, Varakis J, Repanti M, Goumas P, Papadaki H. Estrogen receptor-beta expression in human laryngeal carcinoma: Correlation with the expression of epithelial-mesenchymal transition specific biomarkers. Oncol Rep 2009;22:1063-8. Barrera JE, Shroyer KR, Said S, Hoernig G, Melrose R, Freedman PD, et al. Estrogen and progesterone receptor and p53 gene expression in adenoid cystic cancer. Head Neck Pathol 2008;2:13-8. Cavalot A, Martone T, Roggero N, Brondino G, Pagano M, Cortesina G. Prognostic impact of HER-2/neu expression on squamous head and neck carcinomas. Head Neck 2007;29:655-64. Khademi B, Shirazi FM, Vasei M, Doroudchi M, Gandomi B, Modjtahedi H, et al. The expression of p53, c-erbB-1 and c-erbB-2 molecules and their correlation with prognostic markers in patients with head and neck tumors. Cancer Lett 2002;184:223-30. Angiero F, Sordo RD, Dessy E, Rossi E, Berenzi A, Stefani M, et al. Comparative analysis of c-erbB-2 (HER-2/neu) in squamous cell carcinoma of the tongue: Does over-expression exist? And what is its correlation with traditional diagnostic parameters? J Oral Pathol Med 2008;37:145-50. Sardari Y, Pardis S, Tadbir AA, Ashraf MJ, Fattahi MJ, Ebrahimi H, et al. HER2/neu expression in head and neck squamous cell carcinoma patients is not significantly elevated. Asian Pac J Cancer Prev 2012;13:2891-6. Harrington K, Berrier A, Robinson M, Remenar E, Housset M, de Mendoza FH, et al. Randomised phase II study of oral lapatinib combined with chemoradiotherapy in patients with advanced squamous cell carcinoma of the head and neck: Rationale for future randomised trials in human papilloma virus-negative disease. Eur J Cancer 2013;49:1609-18. Harrington K, Temam S, Mehanna H, D'Cruz A, Jain M, D'Onofrio I, et al. Postoperative adjuvant lapatinib and concurrent chemoradiotherapy followed by maintenance lapatinib monotherapy in high-risk patients with resected squamous cell carcinoma of the head and neck: A phase III, randomized, double-blind, placebo-controlled study. J Clin Oncol 2015;33:4202-9.